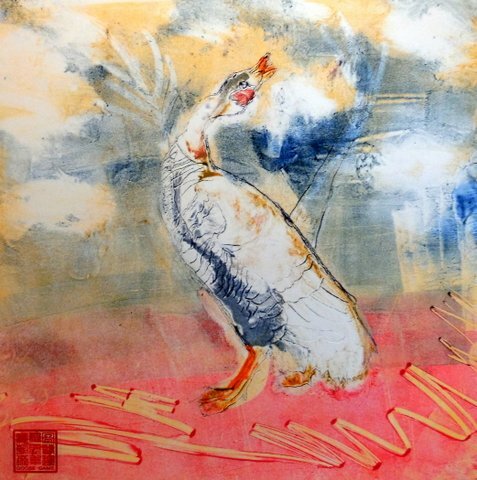 I’ve making experimental monoprints in a series I call the Goose Game. All artists are on a wild goose chase, pursuing an ever-vanishing Muse. There’s no sense to it. Even inventors, or artists of function, have to get lost repeatedly, fumbling in the darkness, before the light goes on. Abstraction, or any creating from nothing, is just plain crazy. I had a chop made in the form of a rubber stamp. 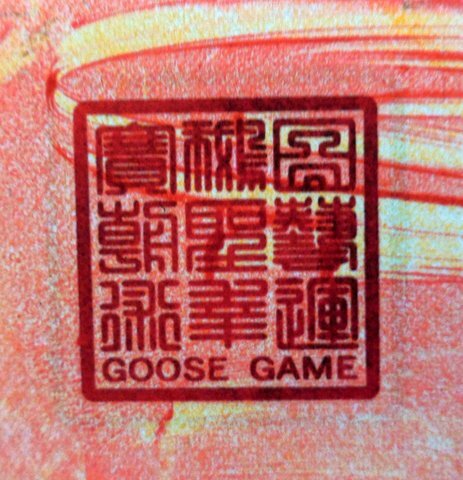 The symbols mean goose, board game, luck, art. A Shakespearean origin of the term “wild goose chase” said it was a kind of horse event where the leader swerved crazily around and the rest of the riders had to follow him. We follow our instincts up the mountain and into the muck and over continents, with the wild goose. I just saw the film Mr. Turner, and I am so glad I did. He was on a wild goose chase of a new vision of land, water and air, though he was often reviled. Some people say “nothing happens” in the film. Nothing happens, except life. He coughs through bitter winters, scribbling in notebooks, attacking the canvas, day after day until death. We walk with him through vast horizons and empty beaches; never again will we see these views so free of humanity. This film shows the big belly, humble scratching. and wide horizon of Turner’s creation. It’s a treat. Everything happens. Yeah, I definitely have got my own versions of the wild goose chase. . . I loved “Mr. Turner” because it showed him being him: relationships, inspirations, pet peeves. Like the goose and the chop, too.